The Sennheiser G4 In-Ear Monitor Combiner Bundle Kit from B&H includes a Sennheiser AC 41-US active antenna combiner with DC power distribution for IEM (In-Ear Monitor) transmitters, a Sennheiser GA 3 rackmount kit for G3 100, 300, and 500 series wireless systems, a Sennheiser A2003UHF directional wide-band transmitting and receiving antenna, an NT 3-1-US power supply, and four BNC cables. This kit can be used in live stage, theater, and rehearsal applications for multiple IEM wireless transmitters to utilize a single wide-band antenna and deliver DC power to multiple transmitter units. The AC 41-US Active Antenna Combiner with DC Power Distribution from Sennheiser is designed for use with IEM (In Ear Monitor) transmitters. It can be used to combine multiple transmitters to utilize a single antenna, and deliver DC power to the transmitter units. It includes one NT 3-1-US power supply and four BNC cables. 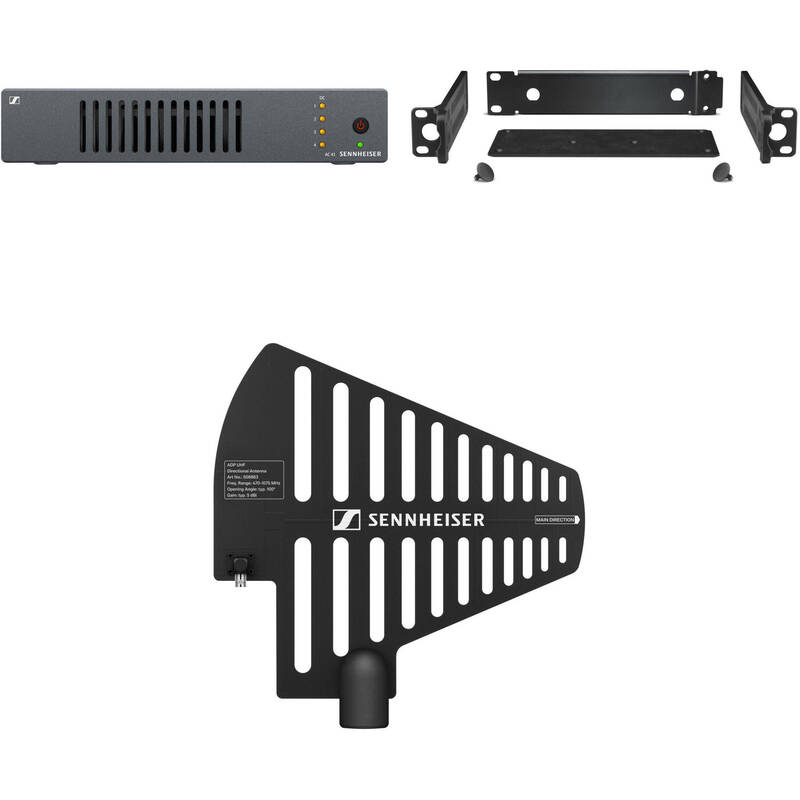 The Sennheiser A2003UHF Wide-Band Directional Antenna enhances transmission and reception for wireless microphone and monitoring systems; such as the Sennheiser SR 300, SR 3054, SR 3056, IEM transmitters, Evolution wireless, 3000 and 5000 series wireless, and the EM-1031U monitoring system. The antenna features directional reception and transmission over wide band 450 - 960MHz UHF frequencies. The antenna is lightweight, easily installs onto a microphone stand and features a standard BNC connection jack. Box Dimensions (LxWxH) 13.75 x 8.5 x 3.25"
Box Dimensions (LxWxH) 12.6 x 12.5 x 3.0"